Ladies– it is now socially acceptable to wear leggings and sweatpants outside of the house and gym. Yes you read that correctly. “Athleisure” is not just a trend that has brought workout wear to the streets, it’s a lifestyle. Though I am not an avid gym go-er, I do consider myself an avid Beyoncé dance class fanatic where I can wear a sporty look. This may derive from my second-grade obsession for the “windbreaker suit” while working the halls of Indian Meadows elementary school – but I digress. In today’s time – it’s all about staying polished. Leggings can be a substitute for pants if you make them appropriate. It’s important to cover the obvious “assets.”. Take a note from the 90’s and wrap your favorite gray sweatshirt around your waist if your top doesn’t make the mark. For this look, I added structure with my American Eagle Outfitters quilted bomber jacket. A military green is a great addition to your wardrobe since it acts as a neutral and can be very versatile as we gear into spring. Layering with my current favorite cropped sweater from Aerie adds the perfect mix of texture. These leggings that I call my “scuba pants” are awesome because they don’t lose their shape. Many brands are starting to sell this fabric in cool new ways from track jackets to tops to even dresses so you can incorporate this trend into your wardrobe whatever your style. Purchasing these Nike Free sneakers changed my life. I didn’t know walking around the city could be so comfortable. The shoes feel like you’re walking on a cloud – not to mention, on my walk to work in the morning I usually spot about 5 other men and women rocking these kicks and we all have an understanding of how comfortable we feel. 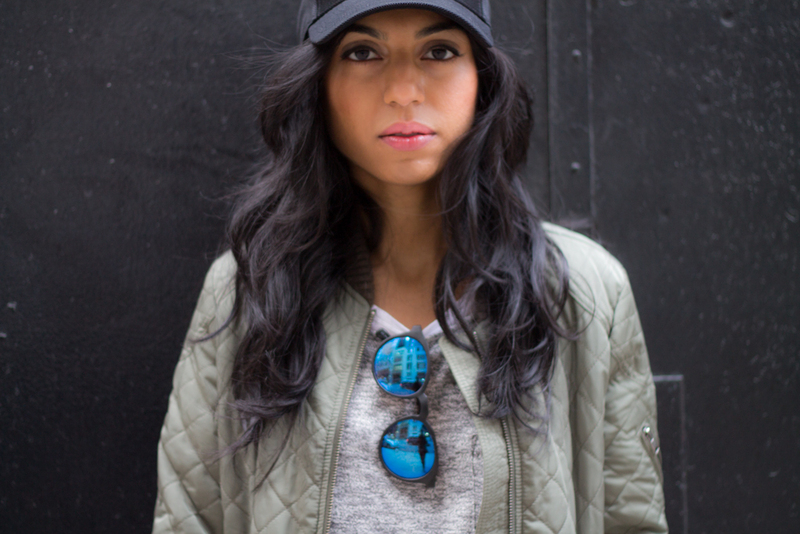 I finished my look with this baseball cap from Aritzia. I love the simple black design and that I can throw it on when I want to feel a little more mysterious. Major congrats are in order for model Kendall Jenner on being the newest face of Estée Lauder cosmetics. After gracing countless runways during fashion week (month really) and filling up our Instagram feed — this reality star continues to give the fashion industry something to talk about and I will definitely be keeping up with Kendall Jenner. Killin’ it.